Its internal power supply is designed to work with 88-240V AC and/or 12Vdc. Operation in dual mode between P25 Digital and conventional repeater modes permitting easy migration from Analog to Digital. It can also be used as a base station and weighs 44 lbs. It’s built in Audit and system logs permits service technicians to review the units operation over the past few days and not just its immediate cycle. 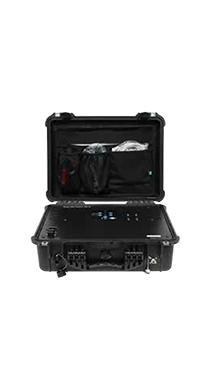 The HARRIS TRANSPORTABLE REPEATER ‘s compact size, features and ruggedness offers Federal agencies, Police Departments, Fire Departments, Professional security firms, schools, Remote construction sites and Search and Rescue teams a fully featured repeater that can be easily carried.